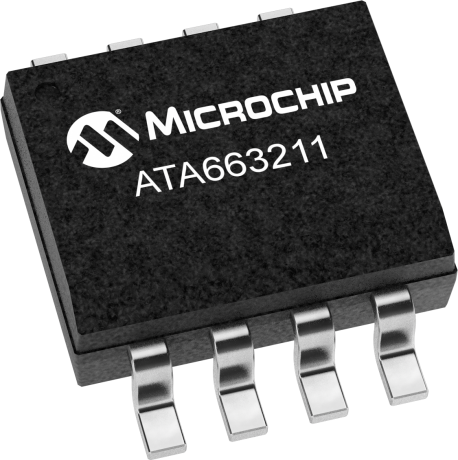 The Microchip ATA663211 is a fully integrated LIN transceiver designed in compliance with the LIN specification 2.0, 2.1, 2.2, 2.2A and SAEJ2602-2. It interfaces the LIN protocol handler and the physical layer. The device is designed to handle the low-speed data communication in vehicles, for example, in convenience electronics. Improved slope control at the LIN bus ensures data communication up to 20Kbaud. Sleep mode guarantees minimal current consumption even in the case of a floating bus line or a short circuit on the LIN bus to GND. The device is available in SO8 package and DFN8 package with wettable flanks for automatic optical inspection. ATA663211A-V1.2 is an evaluation tool for a quick start with s 4th generation LIN transceiver with a local wake-up capability and an inhibit output pin enabling easy prototyping and testing.